Based on recent observations by the Cluster and the Double Star TC-1 satellites, a team of American, European and Chinese scientists have discovered the presence of ion density holes in the solar wind, upstream of the Earth's bow shock, of thousands kilometers in size. More than 140 of such density holes were found, always observed with upstream particles (propagating against the solar wind flow), suggesting that backstreaming energetic particles interacting with the solar wind are important. 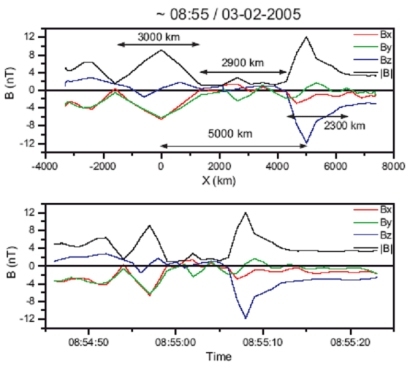 Published 22 May 2006 in Physics of Plasmas journal, this new discovery illustrates the unique capability of Cluster and Double star to provide the microscope into shock physics necessary to understand fundamental physical phenomena at the Earth's bow shock and extrapolate to the more distant planetary and astrophysical shocks. Image 1. Artistic illustration of the descent of the Huygens probe into Titan's atmosphere. Due to the high speed of the probe and the friction of the front heat shield with the atmospheric gas of Titan, a shock wave formed ahead of the shield (copyright: ESA). Image 2. Sketch of the Earth's magnetosphere (in blue), embedded in the solar wind flow. Due to the interaction of the permanent incoming solar wind (coming from the left of the figure) with the Earth's magnetosphere, a permanent collisionless shock called bow shock (yellow arc) is formed in front of the "nose" of the magnetopause - external boundary layer of the magnetosphere (copyright: ESA). On 14 January 2005, the ESA Huygens probe entered the upper layers of Titan's atmosphere at 22 000 km h-1. Thanks to the friction of the front shield with the atmospheric gas, the probe slowed down to 1400 km h-1 in less than 2 minutes. This strong friction caused the formation of a shock wave in front of the heat shield (Image 1). Similarly, a shock is present on the sunward side of each planet of the Solar System, due to a constant flow of particles emitted by the Sun: the solar wind. This wind is usually moving at supersonic speeds of around 400 km s-1 with respect to the planets. Each shock (or bow shock) is the surface in space where the solar wind is first affected by the obstacle. In the case of a planet with no magnetic field like Venus, the planet (or its upper atmosphere/ionosphere) is the obstacle to the solar wind flow. In the case of a planet with a substantial magnetic field like Earth or Jupiter, the planet's magnetic field is the obstacle to the flow (Image 2). Image 3. The right-hand side figure represents the Earth's magnetosphere surrounded by solar wind plasma constantly flowing out of the Sun (coming from the left side of the figure). The white rectangle symbolises where the recent observations have been performed by the Cluster and Double Star satellites: in the solar wind, upstream of the Earth's bow shock (yellow arc). The left-hand side cartoon illustrates these observations. Brown dots represent the solar wind and ions backstreaming against the solar wind flow, along the Interplanetary Magnetic Field (IMF) lines (black lines). Elongated ellipses, along the IMF, represent the new type of plasma density holes discovered. Within these density depletions, the magnetic field strength is greatly reduced, almost to zero, which is emphasized by thinner lines within the holes (copyright: ESA). The bow shock of a planet slows down the solar wind and deflects the bulk of this plasma flow around the planet. The solar wind particles passing through the bow shock are both decelerated and heated rather rapidly. More surprisingly, some of the solar wind particles are reflected and stream away from the shock towards the Sun. These backstreaming particles travel upstream, along the interplanetary magnetic field lines. The role of these particles and their interaction with the incoming solar wind is still unclear. On 2 March 2005, the Double Star TC-1 spacecraft and the Cluster spacefleet were all flying upstream of the bow shock when they all observed a new phenomenon in the solar wind. During ~15 seconds, all spacecraft observed an ion density hole, embedded in the solar wind flow, accompanied by a magnetic hole of nearly the same shape (Image 3). Thanks to the multipoint measurements of the four Cluster spacecraft and Double Star TC-1, the size of this density hole could be estimated: ~3700 km. On both edges of this density depletion, a significant increase of the density and the magnetic field modulus is observed. The size of these edges is ~1300 km Earthward and 2300 km Sunward, making the overall density structure visible over more than 7000 km (Image 4). The Double Star TC-1 spacecraft, located slightly downstream of the Cluster spacecraft, also observed this density hole. Thanks to its measurements, aspects of the temporal evolution of this phenomenon can be described. In particular, TC-1 observations indicate that the speed of the edges could have changed such that the hole was growing at an increasing rate. By analyzing data collected over 6 orbits of Cluster, George Parks (lead author of this research) and co-workers found ~150 density holes of this type. From this sample, they characterized their electromagnetic properties and duration, among other features. Image 4. The density hole of 2 March 2005 is shown as a function of time (second panel) and the spatial dimensions (top panel) are deduced from Cluster and Double Star multi-spacecraft measurements (courtesy of G. Parks, SSL, UC Berkeley, USA). "These density holes are only observed with upstream particles, suggesting that backstreaming energetic particles interacting with the solar wind are important", wrote George Parks, Space Sciences Laboratory, UC Berkeley (USA), in a recent article published online 22 May 2006 in Physics of Plasmas. Parks is co-investigator of the Cluster Ion Spectrometer (CIS) and the Plasma Electron And Current Experiment (PEACE). The data used for this study were collected by the following experiments: the Flux Gate Magnetometer (FGM), the Electric Field and Wave experiment (EFW) and CIS. The details involved in creating these density holes remain unknown. In the near future, improved statistics on upstream plasma and beam parameters such as density, speed or temperature may reveal factors controlling their origin and development. "This new discovery illustrates the unique capability of Cluster and Double Star to study shocks physics. Indeed, among the variety of shock observations now available across the heliosphere, the Cluster and Double Star observations provide a unique microscope necessary to understand fundamental physical phenomena of the Earth's bow shock and extrapolate to the more distant shocks," says Philippe Escoubet, Cluster and Double Star project scientist of the European Space Agency. Parks, G. K., E. Lee, F. Mozer, M. Wilber, E. Lucek, I. Dandouras, H. Rème, C. Mazelle, J. 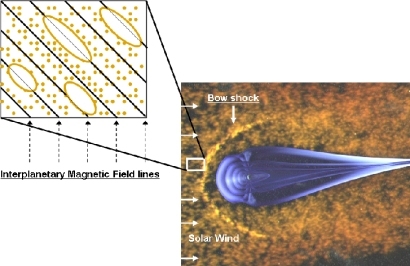 B. Cao, K. Meziane, M. L. Goldstein and P. Escoubet, Larmor radius size density holes discovered in the solar wind upstream of Earth's bow shock, Phys. Plasmas, 13, 050701 (2006). SCI-SH division, RSSD, ESA, The Netherlands. SCI-SH division RSSD, ESA, The Netherlands.